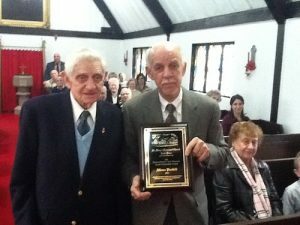 Carle Place: Parish Wasiewski Good Citizenship Award for 2013 goes to Alfonso Piscatelli, American Legion Post 1718 Commander. St. Mary’s Episcopal Church held a special service and reception to honor American Legion Post 1718’s Commander Alfonso Piscitelli. 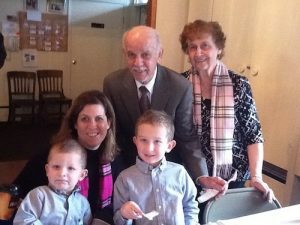 The “Raymond Parish, John Wasiewski Good Citizenship Award.” Named for two of the church’s most respected and prominent parishioners, the award is given each year to someone in the community who has rendered outstanding public service. In addition to the plaque Mr. Piscatelli he was presented, his name is to appear on another plaque in the back of the church right next to John Heslin last year’s honoree. Making the presentation, John H.W,.Rhein 3, the plaque’s designer, said, “Alfonso Piscitelli has a wonderful record of achievement. Married with four daughters and eight grandchildren, he is a Korean War veteran who joined the American Legion in 1987. He was asked to serve as third vice commander during his second meeting. Without knowing what the job entailed he took the assignment, but, in his words he “soon learned.” He first served as commander from 1990 until 1992 and was asked to serve again in 1995 to 1998. The post must have liked his performance because in 2006 he was named to serve in that capacity again, and has remained there ever since. Mr. Piscatelli is an excellent manager and his talents have been tested over and over again as he handles event rentals at the Legion’s building, and. has been the organizer of Legion’s Memorial Day parade and Veterans Day services from the beginning of his tenure. He is publisher of the Legion’s biannual newsletter, and is very involved with the Carle Place schools, and the Boy Scouts and Cub Scouts. He works closely with the Scout leaders, attending their meetings and organizing the interviews for the Boy State candidates. He is responsible for spearheading the post’s veterans hospital initiative by asking for contributions of new athletic socks which will be distributed to those in need.